I enjoy Guy Ritchie films and thankfully Sherlock Holmes is no exception to that rule. With that said, if you're a fan of this quirky and stylised director, than you're definitely in for a treat with this modern remake of an English classic. With larger than life special effects and actors, Sherlock Holmes is a visually impressive movie that boasts an enjoyable story to boot as well. Like most Guy Ritchie films, Sherlock Holmes begins with a bang as Holmes (Robert Downey Jr.) and his "loyal" partner Watson (Jude Law) thwart the nefarious Lord Blackwood (Mark Strong) who is involved in a magical ritual after leaving behind a trail of dead women. Blackwood is hoping to create a new age of magic in this industrial world but is it really supernatural or just parlour tricks? Thankfully before his sick vision is made a reality, he is caught by Holmes and for his crime, Blackwood is sentenced to death by hanging but fate has other ideas and for now, this is another successful mystery solved by the famed Sherlock Holmes. 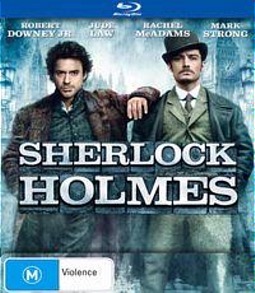 With some great characterisation in the movie, Robert Downey Jr. is superb as this eccentric detective and Ritchie employs a rather interesting aspect to his persona where Holmes takes us through what he is about to do in a fight or when he is investigating for clues. It works quite well and adds a unique perspective on the character by showcasing his intelligence through a visual rewind. Jude Law plays the toffee-nosed Dr. John Watson who is quite stuffy and is the straight man for Holmes. Unfortunately after a barrage of insults from Holmes to his future wife, the relationship between the two is broken and this is a great snapshot of Holmes in this scene. Although the partnership is broken, they are soon drawn back together when they learn that Lord Blackwood has risen from the grave. As they investigate, they uncover a dark conspiracy and a secret organisation which threatens the very fabric of the English government. Reluctantly Watson joins Holmes in his search for this killer with a partial romance thrown in for Holmes with the lovely Rachel McAdams as Irene Adler, a nemesis for our eccentric detective. McAdams is great as a women who portrays girl power in this era and knows how to use her charms on Holmes. Without spoiling too much of the movie, it has a real MTV feel to it that works on many levels, although purists may be disgusted. However for me, I didn't look at my watch once, wondering when this film would end thanks to the story. Ritchie creates a great modern interpretation of Holmes from the special effects of 18th century London to the wonderful cast. Special mention should be made to Mark Strong who plays Blackwood who is quite a scary character and of course Eddie Marsan who acts as the bumbling Inspector Lestrade. Everyone is perfectly cast and the plot comes together rather well. On Blu-ray, the video quality is quite exceptional with sharp images, strong levels of black and vibrant colours. Add in some high definition sound, some interesting and watchable special features and the Blu-ray version of the film has everything you need for a very entertaining movie experience in the comfort of your own home.